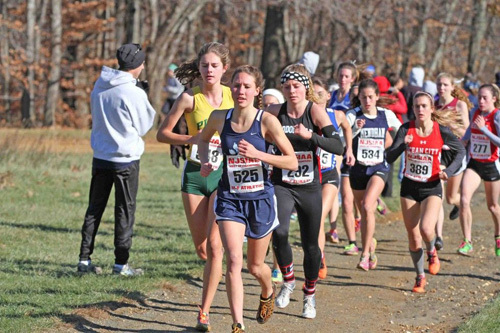 It was another stellar year for Girls Cross Country in New Jersey. Throughout the season The Ladies brought talent and toughness to the hills and trails throughout the Garden State. The season ended with an exciting Meet of Champions Race that crowned the season long top team, Red Bank Catholic and brought many individuals some well deserved glory. 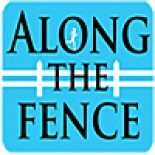 We now proudly present (in alphabetical order) the 2014 “Along the Fence” All State Cross Country Team. New Jersey always seems to have freshmen who make big debuts on the State stage. 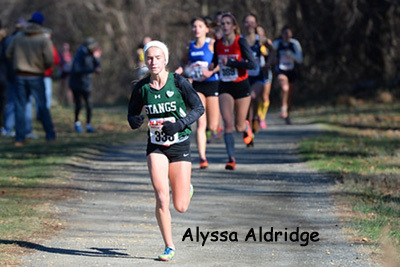 Alyssa Aldridge of Mainland Regional had the biggest debut of all the frosh this year. With wins at the SJ Shootout and the South Jersey Open early in the year, Aldridge already had the makings of an excellent yearling season. After winning her county title (Atlantic Co.), she then took 2nd at the SJ Gr. 3 Sectional (behind Devon Grisbaum), 4th in the Group 3 Championship and capped the year off with the Silver at Meet Of Champions. Her Holmdel season best was 18:22 at MOC. 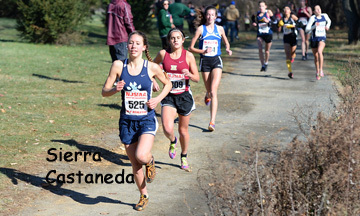 Sierra Castenada, a junior at West Morris Central, was the class of Northwest NJ this season. Scoring wins at the Randolph and Roxbury Invitationals to open her year, Sierra also won both her county (Morris) and conference (NJAC) championships. At the State level, she swept her Sectional (N2 Grp. 3) and Group races to set herself up for a 5th place podium finish at the Meet of Champions. 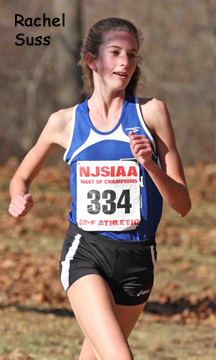 Her Holmdel SB was 18:22 at the Group 3 Race. Sierra will be traveling to the NXN Championships later this month in Portland Oregon, having punched her ticket with a 2nd place finish in the Nike Northeast Regional race. 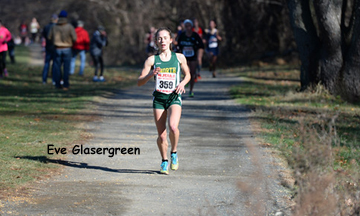 Her “take no prisoners” approach to racing served the Cornell bound Eve Glasergreen well this season as she was undefeated throughout the season until her 3rd place finish at the Meet of Champions after leading for most of the race. Her wins prior to MOC included the NJCTC Bernie Magee Invit., the adidas SCI and the Hunterdon/Sussex/Warren Championships. Missing her conference meet (Skyland) with a viral infection, Eve roared back to capture her Sectional (N2 Grp 4) and Group titles. 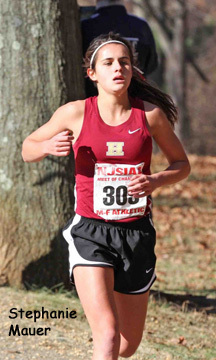 Her Holmdel SB was 18:15 at the Group 4 Race. The mark is also the fastest in NJ over the Holmdel course this year. Devon Grisbaum was a little surprised, but not shocked by her 18:20 Meet of Champions win over a loaded field. After finishing 3rd in the Group 3 Race the previous week, Grisbaum made some minor adjustments, put trust in her preparation and ran a very smart race to take the title of New Jersey Champion. Devon, who will attend Vanderbilt University next fall, patiently moved up throughout the race and after briefly taking the lead and losing it in the back woods, decided to go for it over the last 200 meters to conquer the field. Grisbaum is not a one race wonder. Her senior season was chock full of success. She opened her year with a win (Osprey Invite) and along the way collected titles in her county (Cape May) and conference (Cape-Atlantic) championships as well as at the SJ Group 3 Sectional race. Her Holmdel SB was 18:20 from MOC. For Stephanie Mauer, 2014 was a season of unfinished business. The junior from Hillsborough was on the verge of a breakout season in 2013 when a stress fracture of her shin shelved her for the year after her conference meet. Mauer came back strong this year with wins at her county (Somerset), her conference (Skyland) along with a Sectional title (CJ Gr. 4). 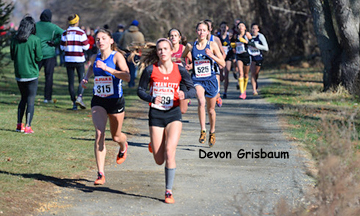 At the Group 4 Championship, Stephanie led her team to the win, finishing second to fellow All Stater, Eve Glasergreen. Her 7th place effort at MOC helped the Lady Raiders to a close runner up finish. 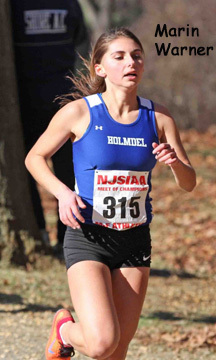 Mauer’s Holmdel SB was her 18:38 at the Meet of Champions. Metuchen HS may be a Group 1 school, but Rachel Suss’ accomplishments were anything but small in 2014. The junior may have surprised some with her big 4th place finish to the season at MOC, but she has been steadily building a resume to mark her as a winner. Suss toed the line at the MOC with a undefeated XC record this year. She won early, triumphs at the CJ Shootout and the Fall Classic. And she won late, titles at her county/conference (Greater Middlesex), Sectional (CJ Gr. 1), and Group. Rachel’s SB on the Holmdel course was 18:35 at the Meet of Champions, a 30 second improvement on her time from Groups the previous week. Last alphabetically, but certainly not least in talent, Holmdel HS senior Marin Warner had the type of season that anyone would want. A string of six straight wins led Warner to the starting line at the Meet of Champions, where she would score a 6th place finish. Marin earned victories at early season meets (Battle @ Ocean Co. Park, adidas SCI) and then went to work on the championship portion of the year scoring county (Monmouth) and conference (Shore) wins. Marin arrived at the MOC via wins at her Sectional meet (CJ Gr. 2) and at the Group 3 race. University of Pennsylvania bound, Warner had a Holmdel SB of 18:30, run at the adidas Shore Coaches Inv. This entry was posted on December 4, 2014 by Patrick Montferrat in 2014 Cross Country and tagged Alyssa Aldridge, Devon Grisbaum, FL Nationals Devon Grisbaum, Stephanie Mauer.